Suicidial creatures aren’t usually common in the animal kingdom – if they were it’s highly unlikely that they would find their way into the world of video games. 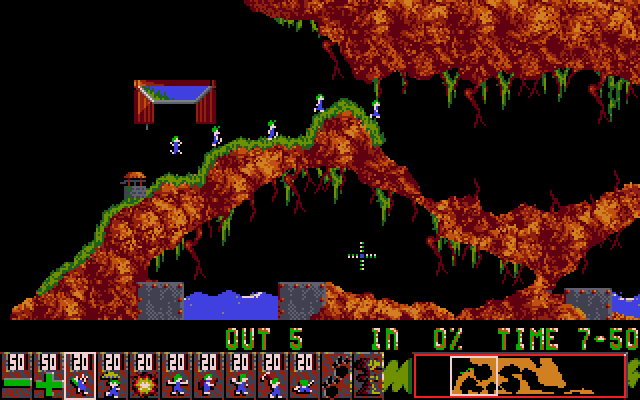 But those masters of the 8-bit gaming (ahem) Ocean clearly though had the foresight and vision to bring these creatures into the video game universe, and released Lemmings on the Amiga. With all successful home computer games, it quickly found it’s way onto a number of consoles including the NES which at the time was sort of popular. In its own way. 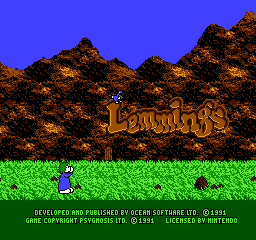 But with the lack of a mouse how does a puzzle-platforming game like Lemmings transfer over onto the console, did it make you want to hurl yourself a cliff into a watery/lava grave or make you want to save yourself for later? How do you transfer these colours to the NES? When starting the cartridge you’ll notice that you cannot skip the main menu – why can’t you do this?! It’s not as if something different happens, you have to sit and wait for the pre-game animation to complete before you can press start, which gets more annoying if you have to reset the game. When you FINALLY get to the main menu, you’re presented with the options to customise your game. You have four difficulty levels but what is a nice touch is that rather than have easy, medium, hard etc, it’s split into Fun (the easiest difficulty) and working it’s way up to Tricky, Taxing and finally Mayhem. If you’ve never played the game before you should stay well clear of the hardest difficulties until you get used to the game, and the controls. Believe me the controls take some getting used to. 3 minutes – can you figure it out? 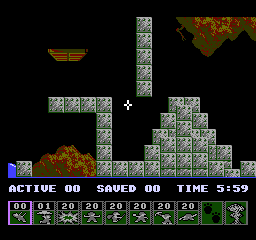 It’s difficult with games that were originally designed for PC DOS or Amiga which utilised the fluid motion of the mouse and clicking the mouse buttons. As much as the d-pad tries to replicate the smoothness of the mouse, it never compares to the feel of a mouse in your hand and being in control. That’s the key word, control. It feels when moving the pointer across the screen that you overshoot the lemming you wish to assign the task to and as a result it may be too late to save that lemming when it walks off the ledge into a nice warm lava pit below. 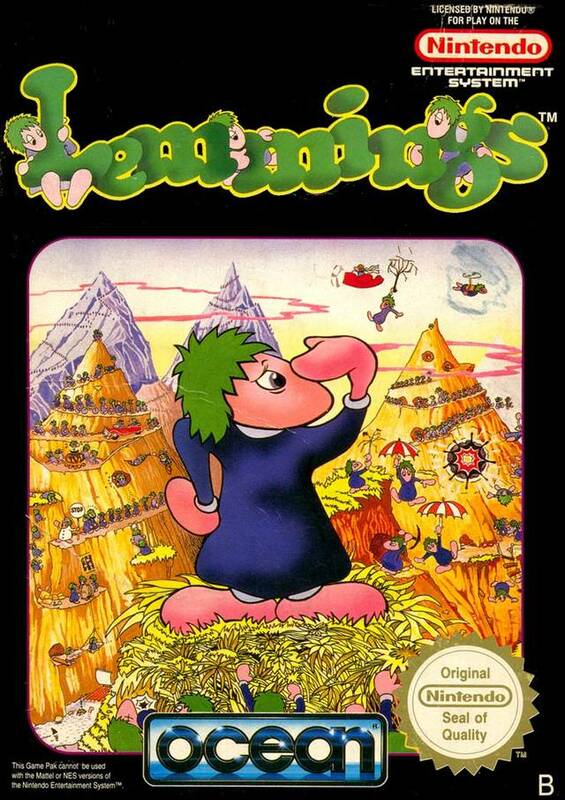 To choose the job that the lemming does, is not a simple press of a button, no they had to make the control awkward by you having to hold the B button down, then selecting the job with the left or right d-pad button and then highlighting the lemming and pressing A to execute the command. The NES control is not blessed with the most amount of buttons for a controller, and it sure is lucky it didn’t take after the Intellivision by having a telephone keypad, but why could the B button not select the job sequentially rather than holding the button down and then pressing left or right. It overcomplicated an issue that should have been relatively straight forward. 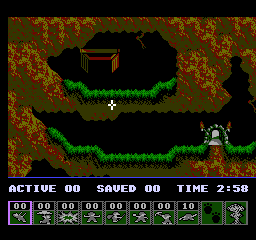 As mentioned before, as the game was on Amiga and PC, with the VGA graphics it sure did look colourful. The NES version did try to replicate this but with the limited palette you do find the murky browns and grey’s creeping into a lot of the levels, but due to the limitations the designers did a good job of trying to making it as colourful as possible with atmospheric dark levels, but the main menu does look like swathes of moss and algae and why do the lemmings gave really yellow eyes – are they drunk on moonshine? The music in the level’s are funky 8 bit renditions of songs you may recognise including the can can so it’s worth keeping the music on and your music device off whilst playing – don’t let it distract you though! So all in all how does this port fare up? Well the developer’s didnt do a bad job with the game. As mentioned earlier in the review, to port a PC game or any home computer game that used a mouse device onto a home console is never easy, and the developers did seem to take this in mind. I suspect on their lunch break they though about the controls which could have been better but with the scroll of the cursor across the screen is slow so most of the time you do feel in control but in the heat of battle you may find yourself wishing Nintendo released a mouse for the console. Copies of the game are out there in the wild, so for a home console it’s worth picking up a copy of the game to get the old grey matter ticking over, so rather then get frustrated with sudokus and wordsearches, pick up a copy of your favourite suicidal creature and a can of Red Bull and save those lemmings!